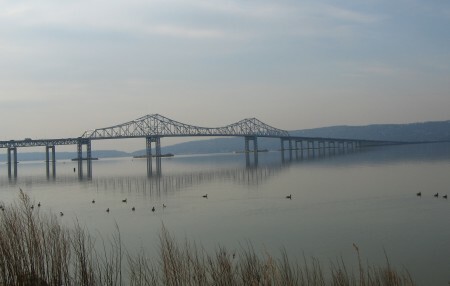 Riverkeeper has been an ardent watchdog of the Tappan Zee Bridge project since 2008 and as steward of the Hudson, laid out specific recommendations that would ensure the river is protected and state resources are allocated to compensate for any unavoidable damage done during construction. Construction on the new bridge began after Riverkeeper joined with partner Scenic Hudson in a settlement agreement with New York State on a stricter construction permit, but concerns about the project’s impact on the Hudson River remain. Riverkeeper formally threatened to sue the State in September 2013 over poor dredging practices and inadequate monitoring of endangered species. In response, the State cleaned up its act on dredging, but is struggling to develop an in-river monitoring system to check on endangered Atlantic Sturgeon during construction. Riverkeeper has made it clear that the current system is not protective enough, and likely doesn’t comply with federal permit requirements, so time is running out for the State to remedy this gap in environmental protection before we take further legal action. Together with Scenic Hudson, we will continue to ensure that the new Tappan Zee Bridge is built in a way that safeguards our river while providing local communities with the modern infrastructure they need. Riverkeeper is also part of a coalition fighting the proposal by Gov. Andrew Cuomo and The New York State Thruway Authority to use $511 million from the Clean Water Act State Revolving Fund (CWSRF) to finance Tappan Zee Bridge construction activities. This illegal and unprecedented loan would divert money from communities across the state in desperate need of water infrastructure improvements. The U.S. Environmental Protection Agency, which provides the seed money for the CWSRF, has questioned the eligibility of environmentally detrimental activities like dredging and bridge demolition for clean-water funding. -2008, Riverkeeper calls on the State agencies involved to offer alternatives to replacing the existing Tappan Zee Bridge with a new structure and challenges the project environmental review process. -On April 2, 2012, Riverkeeper submitted extensive comments on the Draft Environmental Impact Statement (DEIS) to the Tappan Zee Hudson River Crossing Project, calling on state officials to heed the public’s concerns and reconsider their plan to push through a fatally flawed project that is obsolete from day one without mass transit, and would inflict severe damage on the Hudson River ecosystem.